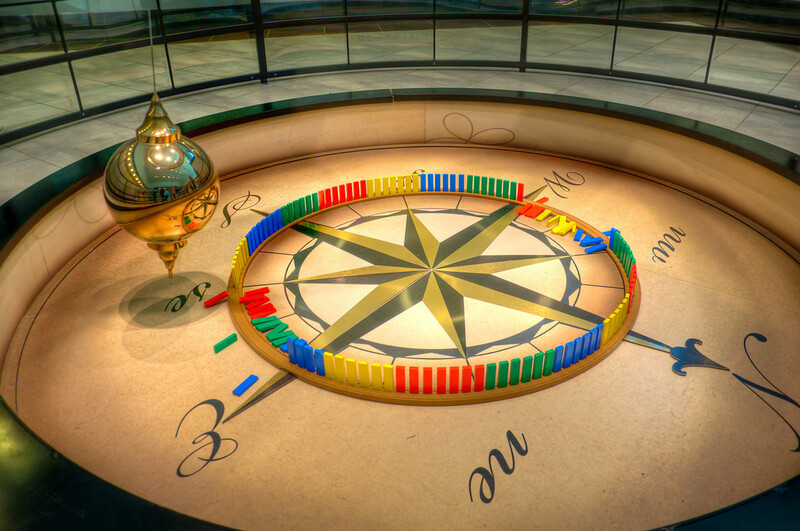 Foucault Pendulum | Just Shooting Memories! I have seen these in several places before and I can still watch them for hours, if I have the time. This is called a Foucault Pendulum and swings with the rotation of the earth. The blocks around the outside get knocked over as it moves around the circle. I was lucky enough to make it by this one just before one of the blocks got knocked over. It fell to the outside, which does not happen often. As you can see here, only five of the twenty nine made it to the outside. For it to fall outside the circle, it gets grazed just barely and begins rocking until the next swing brings it crashing down. Getting the three shots for an HDR was challenging for this one considering I was not using a tripod.